The Backstory: As it stands today,when one of the National Institutes of Health (NIH) provides the funding for a scientific research project, and those results are published, they must be made freely available to public, within a set period of time. The reasoning behind this requirement is that taxpayers funded everything about the research except for the final publication, and so they have already paid for access. The Research Works Act (#RWA), HR 3699, is a bill in the House of Representatives that would roll back this requirement. If it passes, taxpayers will most likely have to pay exorbitant fees for access to publicly-funded research. I'll explain why in a moment. The Research Works Act will harm science education because students and instructors at small colleges and community colleges generally lack access to scientific journals and we will no longer be able to afford to use scientific literature in our courses. How much does it cost? One commenter on a my earlier post about the effect on science education noted that students and others would still be able to purchase research articles if RWA passes. I thought, dear readers, you might like to know what that privilege is likely to cost. What does a personal subscription cost today? Today, a one year personal subscription to Science costs $149 for a member and $75 for a student. A personal subscription for one year of Nature costs $199. We subscribe to both and pay $350 a year for the privilege. The problem is that working in science, and learning about science, requires looking at papers from multiple journals and multiple years from those journals. Access to one journal is rarely sufficient. Let's look at the subscription costs for some other journals. 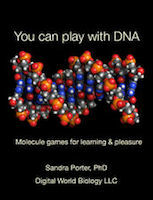 Two other journals that I frequently use are Nature Genetics and Nature Biotechnology. These cost $225 per year and $250 per year, respectively. Here are the yearly subscription costs for a few of the other Nature journals: $503 Acta Pharmacologica Sinica $586 American Journal of Hypertension $319 Asian Journal of Andrology $865 Bone Marrow Transplantation $99 BoneKEy Reports $474 British Dental Journal $569 British Journal of Cancer $542 Cancer Gene Therapy $417 Cell Death and Differentiation $417 Cell Research At $865 per year, a personal subscription to the on-line only version, of Bone Marrow Transplantation would be hard for me to justify. But then, I'm not an M.D. Now, consider Nature has 91 publications, with many subscription costs over $300 per year for each journal. I've been told that library subscriptions are more costly than personal subscriptions. Is it really that surprising that our libraries say no? What do individual articles cost? Could we get by with having students read individual articles? I looked up the prices for individual articles from some of the journals that I use. 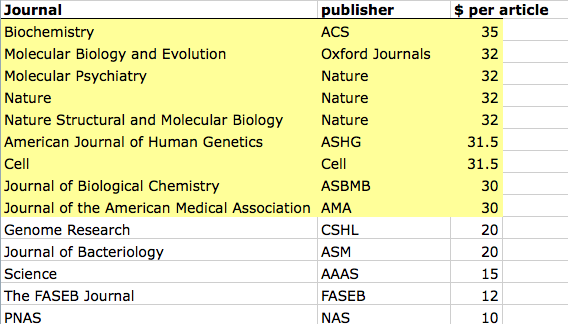 The table below shows the costs to purchase a single article from 14 different journals. Out the 14 journals, 9 of them charge $30 per article or more. I looked at multiple Nature journals since the prices for each journal subscription varied so widely. Many times when we have students research a topic, we want them to look at multiple articles from multiple journals. Students might need to look at ten papers to complete an assignment. We also tend to have students investigate different topics. This means that we can't just give every student the same set of articles. Each student needs to get multiple articles from multiple sources, and each article could cost $30-35 at today's prices. Today, we can make do by having students stick to open access articles. RWA will kill that option. If papers were priced more reasonably, like songs in iTunes, we instructors would find RWA less alarming. But as it stands, if publishers charge the all articles with the prices they're using now, it will kill our ability to use the literature in the classroom.